We currently do not carry this item at this online store. 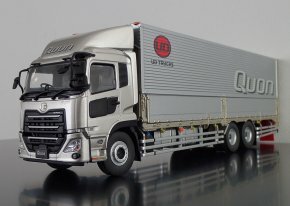 Quon CD 1:43 scale model. Wing opening style, dry cargo truck. 1:43 scale model. White cabin and silver dry wing van body. Moveable Parts:Wings open and close. Sideboards on truck bed open to a horizontal position. * Display case not included. *Decal stickers are for the Japanese market. Please kindly note that it may not be applicable in your region/country.